Fallout Shelter Sign, Mt. Rona Baptist Church, 13th & Monroe NW. Only a handful of the original fallout shelter signs remain. Based on initial surveys, just 5-10% of signs survive. With their official purpose long forgotten and landowners unaware of their significance, many former shelters have already lost their markers and many more will follow if action is not taken. 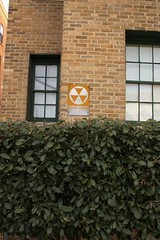 When buildings are repainted or remodeled, the weathered fallout shelter sign is one of the first things to come down. Fallout shelter signs are also pried from buildings by vandals and stolen as curiosities. Currently, nothing protects these historic artifacts from destruction. If protective action is not taken soon, all of the signs may disappear in the coming years. Washington is a historic city that prides itself on preserving and maintaining its historic buildings, districts, and national monuments. The Cold War is an important chapter in the history of the United States and preserving landmarks from that era should be taken as seriously as preserving landmarks from other periods in American history. Fallout shelter signs are a unique historic element in our built environment. The signs embody legitimate Cold War fears of a world conflagration and are a testament to a conflict that consumed the globe for nearly a century. For contemporary denizens of the District, the ubiquitous fallout shelter sign made the threat of nuclear annihilation tangible on a daily basis. The fallout shelter sign should be preserved as a physical memory of a frightening era in American and world history, a history in which Washington played a large role. 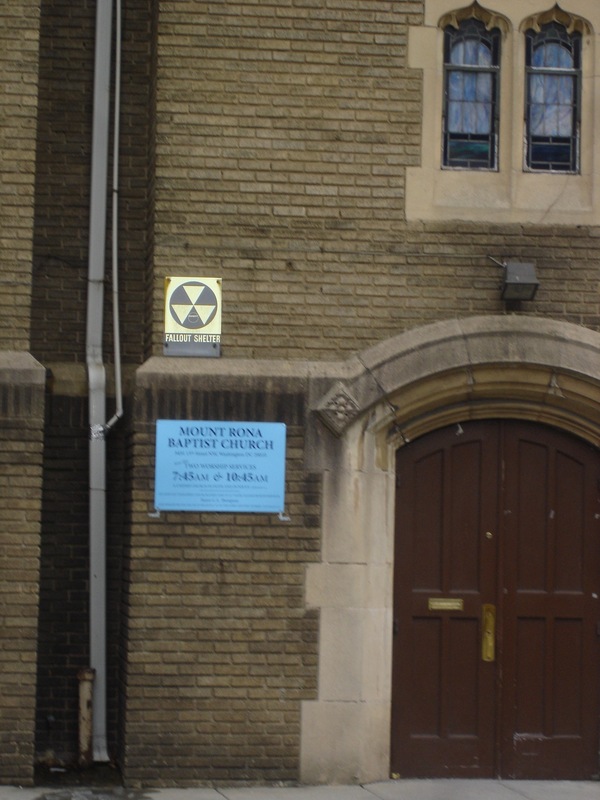 The fallout shelter sign reminds us to heed the lessons of the Cold War and of the enduring dangers of a world armed with nuclear weapons. 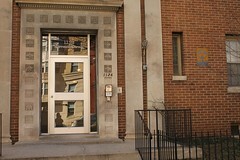 A fallout shelter sign was originally posted on this building near Georgia Ave NW. 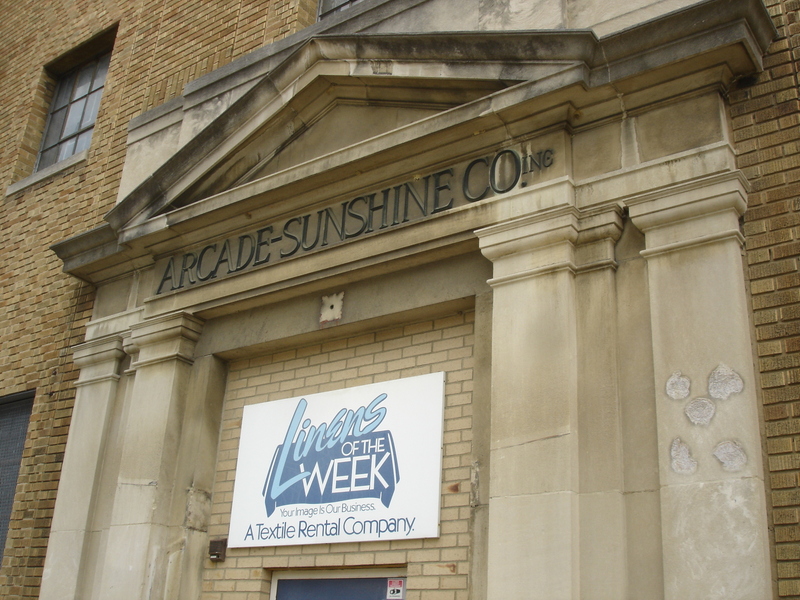 Now there are just a few holes in the facade where the sign was posted (right side of picture). Fallout shelter signs could be preserved in Washington in a variety of ways. While it may be impossible to permanently preserve all of the extant signs, the District can take steps to protect the signs in situ and educate the public of their importance. ﻿If nothing is done, however, these once common signs will slowly but surely disappear from D.C. facades until this unusual urban history is no longer legible and is lost forever. The first and most important step is to educate the community about the existence of the fallout shelter signs and the history of shelters in the District. We’d like the community to share in our excitement for these unique pieces of history. In the same fashion as the city’s fire callboxes were repurposed, the signs could also be incorporated into a District-wide Cold War history project, with markers providing the passersby with both national and local historical contexts. The second step is the physical preservation of the signs. ﻿An inventory of existing signs should be compiled and the owners of the buildings should be informed of the significance of the markers. As many of the remaining signs are on government buildings and schools, we will contact the General Services Administration and DC Public School Department to advocate for their preservation. We hope building owners will recognize the historic significance of the signs that mark their buildings and importance of keeping the signs in place. associated with historical periods, social movements, groups, institutions, achievements, or patterns of growth and change that contributed significantly to the heritage, culture or development of the District of Columbia or the nation. Further, to qualify for designation, the landmark must possess sufficient integrity, meaning that it possesses historic characteristics that sufficiently convey its historic significance. Based upon these criteria, fallout shelter signs are eligible for historic landmark designation. They are one of the only physical reminders still in existence in our community of the Cold War, a significant historical period. Further, as fallout shelter signs have changed little since the day they were posted, all of the signs we have seen retain their historical integrity. However, landmarking fallout shelter signs would not mean landmarking the buildings they are affixed to. Fallout shelter signs should ideally be treated as historic markers. 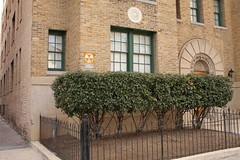 A building owner could alter the facade or even tear down a building with a fallout shelter sign posted on it, provided the sign was later reposted in the same location. The geographic context of the signs is the historic quality, not necessarily the structure the shelters were located in. For this reason, building owners shouldn’t see the signs as a burden, but as a historical resource adding color to and fostering interest in their properties.